Footfall is a great book. Not the crowning achievement of The Mote in God's Eye or Inferno, but a hell of a good read. [According to these authors, all you need to characterize a state as a theocracy] are politicians who invoke religion and apply Christian principles to public policy...If that's all it takes to make a theocracy, then these writers are correct: Contemporary America is run by theocrats. Of course, by that measure, so was the America of every previous era. The United States has always been at once a secular republic and a religious nation, reflexively libertarian and fiercely pious, and this tension has been working itself out in our politics for more than two hundred years...[T]his is a history that the anti-theocrats seem determined to reject. The Christian Right isn't just bad for America because any application of faith to politics is inevitably poisonous, intolerant, and illiberal. Though there is no discontinuity with earlier American practice in the role of religion in the Republican Party, Douthat suggests that there might be such a discontinuity in the attitude of the Democrats. As Douthat observes, the Democratic leadership consciously decided in 1972 to disassociate itself from its New Deal base of socially conservative blue-collar workers. (1972 was the year, of course, when George McGovern was the Democratic presidential nominee, and the floor of the convention was full of men sporting long hair and persons of all genders wearing sandals.) Though religion was not first in the party's calculations, their strategy implicitly bet on the secularization hypothesis. They are betting on it still: hence these four books of polemics. Granted that there is no discontinuity on the side of the Republicans, however, I must note that we are within a few decades of the end of the Modern Era, and that we are seeing preliminary manifestations of the Second Religiousness. In the Spenglerian model, the Second Religiousness does not imply a theocracy, either, but it does imply a cultural climate in which informed opinion no longer finds religious tradition problematical. This does not occur because the religious impulse grows stronger, but because the skeptical alternative becomes corrupt and loses credibility. I incline to agree that Intelligent Design is a scam, but it is the cultural Left that will win the Darwin Award. In contrast, as I have remarked before, the economic Left has a future. I always thought the question about Mr. Reed is: Is he a Christian who went into politics, or a politician who went into Christianity? Was he sincere and driven by a desire to have a positive impact on public policy, or a mover driven by a desire to get a piece of the action as American Christians, disaffected from a Democratic Party that had grown wildly insensitive to, and in fact disdainful of, their values, started to become a force in the Republican Party? Maybe one or the other, maybe both, maybe both but to different degrees. I once overheard him say to a friend, a year ago, that if "they" didn't stop him as he ran for his first public office, he would be "unstoppable." "They" was the political left. He expected a rough race, but he seemed optimistic. What struck me though was the word "unstoppable." I realized: He means if he wins, he'll run for governor and then president. He sounded like a mover. And he didn't seem sincere, not in any sweet, "this is what I believe" way. I think he'd grown enamored of being an insider, a top and big-time operative in Republican politics and within the White House. When he spoke of the White House, he said "we." Reed did not stumble simply because of personal arrogance, of course. After working for Pat Robertson and the Christian Coalition, he became a professional lobbyist. In that connection, his name became linked with some of the most outlandish schemes of Jack Abramoff. He is, perhaps, one of those people who are better suited to the study of political science than to its practice. `(a) Except as provided in subsection (b), no court created by Act of Congress shall have any jurisdiction, and the Supreme Court shall have no appellate jurisdiction, to hear or decide any question pertaining to the interpretation of, or the validity under the Constitution of, the Pledge of Allegiance, as defined in section 4 of title 4, or its recitation. `(2) the Superior Court of the District of Columbia or the District of Columbia Court of Appeals;'. I scratched my head about paragraph (b)(2) until I recalled that the intent of Congress was to let the states decide whether their own constitutions forbid the inclusion of "under God"; Congress was just treating the District of Columbia as a state. If you held a gun to my head and asked me whether Congress has the power to remove this question from the jurisdiction of the Supreme Court, I would say: "Yes, Congress does, by the plain words of Article III. And please don't shoot me; I'll buy all the magazines you want me to buy." That is, however, one of the questions we really don't want answered. The argument on the other side is that the text must be interpreted within the overall structure of the Constitution. The Court does that all the time when parts of the text are in conflict. I think that this kind of limitation of jurisdiction is exactly what the framers had in mind, but it would not be irrational if the Court found otherwise. The interesting question is whether Congress and the President could ignore a Supreme Court ruling that was not just wrong, but obviously beyond the power of the Supreme Court to make. If you actually cocked the gun, I would say, "Yes!" With any luck at all the Senate will let the legislation die. This is, of course, an appeal to the Fermi Paradox, which assumes that if sophisticated societies are common, they should also be ubiquitous. Well, I just checked the parking lot outside the Institute, and I see no large animals with long, prehensile noses. 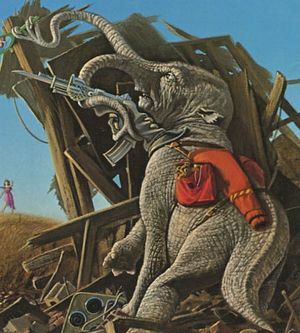 The conclusion a la Fermi is that elephants don't exist on this Earth, right? After all, any putative pachyderms have had plenty of time to get to my office, even if only a few of them are so inclined. Elephants and extraterrestrials? Be careful what you wish for. Interested in overthrowing the government of Iran? Get your information here.